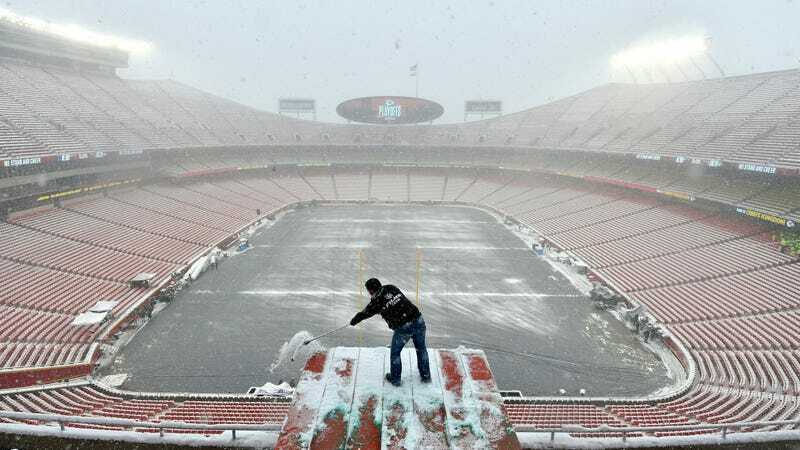 Clearing snow ahead of the Kansas Chiefs playoff game last weekend. The coming weekend’s game promises to be even colder. On Sunday, two of the nation’s greatest nemeses will be in Kansas City: the Patriots and the polar vortex. 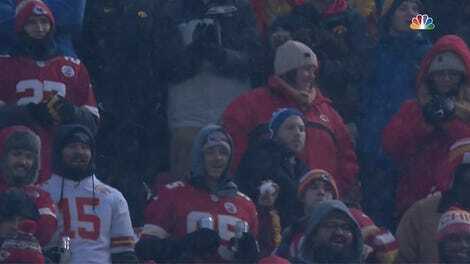 Tailgating at the NFL conference championship game at Kansas City’s Arrowhead Stadium will not be for the faint at heart with temperatures in the single digits and quite possibly sub-zero by game time. Are you ready for some football (and frostbite)? Like Tom Brady’s inexorable march to an eighth consecutive AFC championship game, the wheels were set in motion for the cold air outbreak long ago (at least by weather standards). Right around New Year’s Day, the layer above the atmospheric layer we inhabit, known as the stratosphere, rapidly warmed in the Arctic. We’re talking a jump over the course of a few days from around minus-103 degrees to 14 degrees Fahrenheit. Known as a sudden stratospheric warming event, these spikes in temperature can propagate down to the lower atmosphere where the polar vortex normally sits. 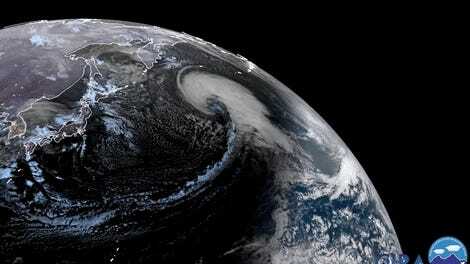 In regular times, the vortex is simply a low-pressure system camped over the Arctic and contained by a river of air. But sudden stratospheric warming events can break down that river, allowing the cold air associated with the polar vortex to leak down toward North America and Europe. It takes a few weeks for these things to work their way through the atmosphere, and now the Midwest is about to face the impacts. Amy Butler, a climate scientist at the Cooperative Institute for Research in Environmental Sciences in Boulder, told Earther earlier this month that the sudden stratospheric warming event in early January caused a three-way split in the polar vortex. That’s been somewhat interesting, though she said the magnitude of the stratospheric warming—and thus the impacts—are likely to be less intense than what we saw last year when the East Coast was bombarded by polar vortex-influenced nor’easters. Just don’t tell that to the football diehards planning to trek to Arrowhead and watch the Pats take on the Chiefs on Sunday. Cold air will spread across the Midwest, but the coldest of cold is centered on Kansas City. Temperatures are expected to be upwards of 45 degrees Fahrenheit below normal. The National Weather Service is calling for a high of 9 degrees Fahrenheit, but that will be a distant memory by the early evening kickoff. Lows are forecast to bottom out at zero, though some weather models have the mercury dropping even lower. One degree Fahrenheit is the coldest kickoff at Arrowhead (a record that was set in 1983, and tied in 2016) so it’s not inconceivable we could see a new record set on Sunday. Other parts of the Midwest should be on ice, too, as well as a large chunk of eastern Canada. “I absolutely believe that the cold descending on the Midwest this weekend is related to the polar vortex breakup/SSW that began earlier this month and still ongoing,” Judah Cohen, an atmospheric scientist with AER, a Verisk Business, told Earther using the meteorological parlance for stratospheric warming event. He pointed to last week’s European chill with rare Greek snow as the first sign of the destabilized polar vortex. “I would expect not continuous but episodic outbreaks of more severe winter weather including both cold and snow across the U.S. in the coming weeks related to the polar vortex split/SSW,” Cohen continued. Some recent research suggests climate change and Arctic warming could lead to more weird weather outbreaks like this in the midlatitudes. In other words, either in the coming weeks or years, there’s a good chance more of us will get the chance to be just like Tom Brady (minus the Super Bowl wins, strong brain, and fancy dog lifestyle).